A first person shooter controlled by your hands. Using the leap motion, we detect changes in the vertical motion of your hands so that you can "shoot" out of your fingers to knock over bottles as fast as possible. 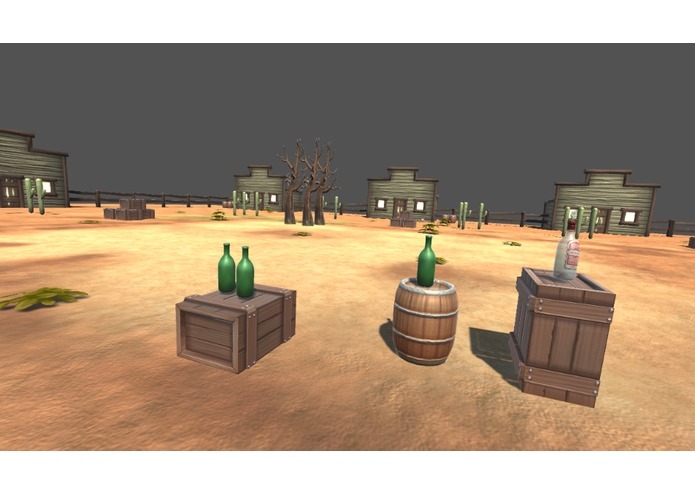 We used Unity to easily create a 3D world and support the Oculus Rift for vision. It was difficult to properly detect the gesture required to shoot. It may have been easier on an older SDK, but the tracking was a lot worse so we decided it would be better to use the newer SDK and manually detect the motion. Creating something in Unity after not properly using it before, and effectively using the Leap Motion. We may develop this into a small full demo (Or at least make the shooting much more reliable). Helped with the creation of the game world and the adjusting of the hand controls. Also made a basic story to put the game in context. It is the year 3571. A superintelligent alien being known only as The Sheriff has taken control of the Earth and regressed it to the era of the Wild West. Only four noble Sheriffs: Sheriff Kaye, Sheriff King, Sheriff Bennett and Sheriff Sabourin can save the world, by destroying nondescript glass bottles in the evil Sheriff's arena of death. Worked on leap integration and created shooting mechanics.